In August of 1934, Georgia O’Keeffe visited Ghost Ranch, north of Abiquiú, for the first time and decided immediately to live there; in 1940, she moved into a house on the ranch property. The varicolored cliffs of Ghost Ranch inspired some of her most famous landscapes. In 1977, O’Keeffe wrote: “[the] cliffs over there are almost painted for you—you think—until you try to paint them.” Among guests to visit her at the ranch over the years were Charles and Anne Lindbergh, singer-songwriter Joni Mitchell, poet Allen Ginsberg, and photographer Ansel Adams. She traveled and camped at “Black Place” often with her friend, Maria Chabot, and later with Eliot Porter. O’Keeffe bought a second house in 1945, an abandoned hacienda in Abiquiú, which she renovated into a home and studio. By 1949 she had moved permanently to Abiquiu, spending time at both Ghost Ranch and the Abiquiú house that she made into her studio. 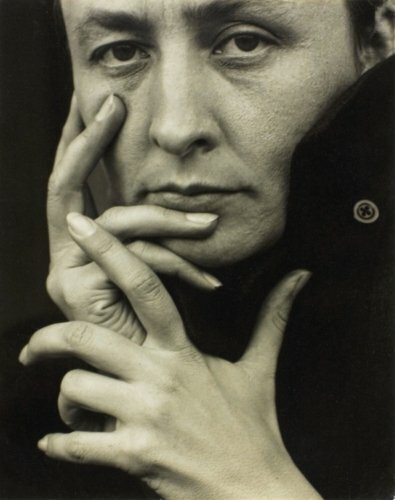 After O’Keeffe died in 1986, a substantial part of her estate’s assets were transferred to the Georgia O’Keeffe Foundation, a nonprofit. The Georgia O’Keeffe Museum opened in Santa Fe in 1997. The assets included a large body of her work, photographs, archival materials, and her Abiquiú house, library, and property. The Georgia O’Keeffe Home and Studio in Abiquiú was designated a National Historic Landmark in 1998 and is now owned by the Georgia O’Keeffe Museum.